As you probably know, Coldplay is a British alternative rock band with a sound that is simultaneously pensive and high energy with a bit of pop and passion. They have earned numerous awards, including seven Grammys. Mylo Xyloto is their fifth studio album since their inception in 1997. Beginning with Hurts Like Heaven, the band performed with an electricity that was contagious to the crowd. They played a great mix of new songs and old favorites: Paradise, Princess of China, Yellow, In My Place, Amsterdam (played in full for the first time since 2005). They even snuck in a Louis Armstrong cover of What a Wonderful World, a sweet rendition featuring only Martin and his piano (for a complete playlist see below). The main stage was huge with a long walkway, plus a small mini-stage within the crowd for a more intimate set. The sound was incredible live, which certainly cannot be said of every band. Vocals were spot on, music was perfect, sound and speakers well balanced. How awful it is to attend a concert with distorted sound! 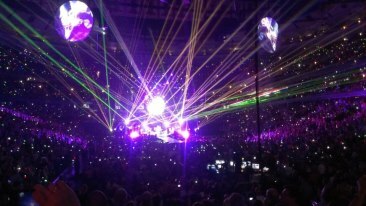 The laser lights timed to the music added to the visual intensity, as did the numerous confetti eruptions and graffiti symbols that covered the album. They even provided bracelets, or xylobands, for the crowd that also lit up to the music. Overall this was an excellent concert experience that I highly recommended. While I must admit Coldplay is one of my all-time favorite bands, that was also the consensus of those we met at the concert. They ended with Every Teardrop is a Waterfall, somehow still with tons of energy. The only diappointment was that it had to end. Thanks for reading. Have you seen Coldplay in concert? Leave a comment below! Posted in Music and tagged Chris Martin, Coldplay, Concert, GRAMMY, Guy Berryman, Jonny Buckland, myloxyloto, review, something to consider, somethingtoconsider, somethingtoconsider1, somethingtoconsiderblog, Will Champion. Bookmark the permalink.